Question: What are my options for replacing worn lifelines? Most lifelines are made of wire, usually uncoated 1×19 grade 316 stainless steel which is well suited for stationary applications such as lifelines. Diameters vary depending on the size of the boat. We generally use 1/8” wire for boats under 30’ and 3/16” for boats 30’ and longer, although there are exceptions (J-105s for example prefer 5/32”). Of course, you can go heavier, but the extra weight can be prohibitive. Boat owners are moving away from the vinyl covered 3/16” wire that has been the industry standard for years. In fact, the 2016 Safety Equipment Requirements no longer allow coated wire on coastal and ocean racing sailboats (there is a list of the 2016 racing SERs associated with lifelines at the end of this article). But if you don’t plan to race, you may still prefer the feel and appearance of coated wire. Vinyl coated wire’s primary advantage is that it is attractive and comfortable to handle. It can, however, discolor and crack over time, is susceptible to heat, and makes it difficult to inspect the wire underneath. 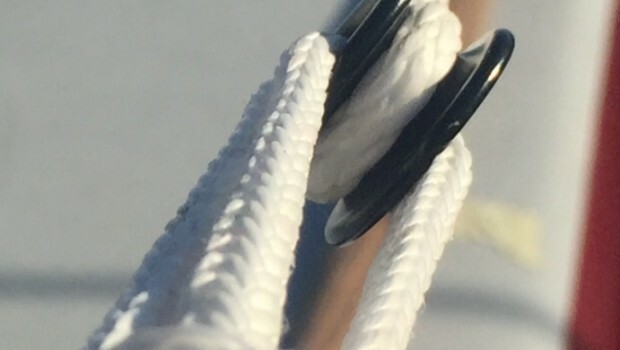 Synthetic lifelines made of low stretch Dyneema are becoming a popular alternative to wire. Dyneema, made of High Modulus Polyethylene (HMPE), is stronger and much lighter than steel. It is easy to install, can be spliced, doesn’t rust, and is easy to handle. Although it is more susceptible to chafing, chafe points can be protected with extra layers and/or tape. When converting from wire to Dyneema, be especially conscious of existing burrs on your stanchions, a common cause of chafing. We recently installed Dyneema lifelines on a 38’ catamaran, and the customer was very happy with the results. Regardless of whether you choose wire, coated wire, or Dyneema, we recommend that you always purchase high quality 316 grade fittings, including your turnbuckles, pelican hooks, gate eyes, toggle jaws, deck toggles, etc. We recommend Hayn, Johnson or Arco fittings which operate smoothly and withstand high loads. We also suggest taping or pinning your fittings whenever possible. 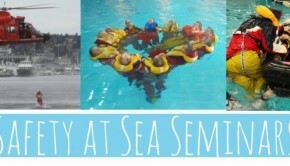 Sailors end up in the water as a result of fitting failures. Don’t scrimp here! Your connections can be hand crimped, machine swaged, or spliced (in the case of Dyneema lines). Hand crimping is the least expensive “do-it-yourself” option but not our first choice. Hand crimping often leaves a bulky joint and can be susceptible to pulling free under load. We often see poorly/under-crimped connections which are definitely not safe. A proper swage is the strongest option. 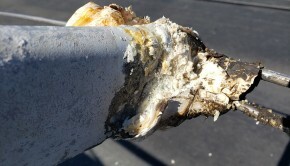 Unlike hand-crimped connections that may simply break free, a tired swage connection will generally reveal hairline cracks prior to failing, giving you time to replace them. As for splicing those Dyneema lines, we do that here at Rigworks! Finally, stanchions are often the weak link in your lifeline system. Tall and narrow, they are susceptible to bending, especially when used to catch the boat as you dock or to tie off sheets and halyards. Delamination and cracking at the base are also quite common. Use grade 316 stainless steel 1” diameter stanchions to reduce the likelihood of bending. Always check welds on bales and bases for rust which can be a telltale sign of cracking. Be sure that each stanchion is properly braced and bolted into a reinforced area of your deck and/or into a backing plate. Of course, this is only the tip of the iceberg. Stanchion height and placement, line spacing (both horizontally and vertically), tension, deflection, toerails, etc. all need to be carefully considered. For professional installation or to discuss your own lifelines, email us at info@rigworks.com or call us at 619-223-3788. We always look forward to hearing from you! A boat’s stanchion and pulpit bases shall be within the working deck. Stanchions used with High Modulus Polyethylene (HMPE) shall have rounded openings to reduce chafe. Bow pulpits may be open, but the opening between the vertical portion of stanchion pulpit and any part of the boat shall not exceed 14.2″ (360mm). Lifelines may be either uncoated stainless steel wire or HMPE line with spliced terminations or terminals specifically intended for the purpose. A multipart-lashing segment not to exceed 4″ per end termination for the purpose of attaching lifelines to pulpits is allowed. Lifelines shall be taut (see below). When HMPE is used, the load-bearing portion (core) shall meet or exceed minimum diameter requirements. When a deflecting force of 9 lbs (40N) is applied to a lifeline midway between supports of an upper or single lifeline, the lifeline shall not deflect more than 2” (50mm). This measurement shall be taken at the widest span between supports that are aft of the mast. 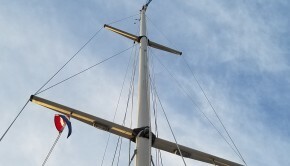 When a deflecting force of 9 lbs (40N) is applied midway between supports of an intermediate lifeline of all spans that are aft of the mast, deflection shall not exceed 5” (120mm) from a straight line between the stanchions. The maximum spacing between lifeline supports (e.g. stanchions and pulpits) shall be 87″ (2.2m). Boats under 30′ (9.14m) shall have at least one lifeline with 18″ (457mm) minimum height above deck, and a maximum vertical gap of 18″ (457mm). Taller heights will require a second lifeline. 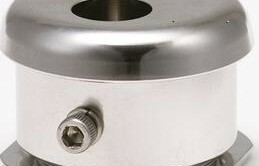 The minimum diameter shall be 1/8″ (3mm). Boats 30′ and over (9.14m) shall have at least two lifelines with 24″ (762mm) minimum height above deck, and a maximum vertical gap of 15″ (381mm). The minimum diameter will be 5/32″ (4mm) for boats to 43′ (13.1m) and 3/16″ (5mm) for boats over 43′ (13.1m). Toe rails shall be fitted around the foredeck from the base of the mast with a minimum height of 3/4″ (18mm) for boats under 30′ (9.14m) and 1″ (25mm) for boats over 30′. An additional installed lifeline that is 1-2″ (25-51mm) above the deck will satisfy this requirement for boats without toerails. Trimarans are exempted from the lifeline requirement where there is a trampoline outboard of the main hull, except that a lifeline must run from the top of a bow pulpit to the forward crossbeam at the outboard edge of the bow net or foredeck. Catamarans with trampoline nets between the hulls are exempted from the lifeline requirement. All catamarans are exempted from the need for pulpits and lifelines across the bow.